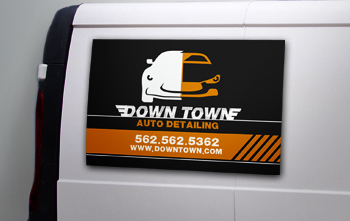 Car magnets are an affordable way to advertise your business as you travel around the city. Make use of your delivery trucks and even your personal car by making them your own moving billboards. Your business information can reach a larger audience while making a delivery or simply driving around, because their spacious doors make any vehicle the perfect space for promotion on the go. After all, marketing your business doesn't have to be limited to your business hours. Maximize your vehicles with personalized car magnets here at NextDayFlyers. Upload your design or use our online design tool to customize your own from scratch. With the strong 30 mil. magnetic strength and laminated coating, you will be sure that your car magnet can withstand vehicle motion and changing weather conditions. Our fast printing turnaround time can print yours as soon as the next day, guaranteed! Car magnets might seem like unorthodox marketing for some business owners. If you're on the fence about using them, read on. Here are some reasons why you should use them to promote your business. You might think that putting a magnetic sign on your vehicle doors might affect it resale value. Actually, the magnetic strip, although powerful, doesn't damage your car door. Go ahead and put your business logo and information there and remove it easily with no noticeable mark. Being a magnet, you can easily transfer it from vehicle to vehicle. If you want to change the design, you can do so very easily. Finally, if you want to use your vehicle for other reasons, you can just remove the sign and place it later. But then again, why would you? As a business owner, you want to promote your business but minimize your costs. Car magnets are essentially moving billboards. Driving your car or using it for deliveries, while displaying a magnetic sign on the side, is hitting two birds with one stone. Car Magnets is rated 5.0 out of 5 by 5. Rated 5 out of 5 by joyce52 from Great Car Magnets! Awesome job! I was very pleased with the outcome. Rated 5 out of 5 by Cynde from As per every order, I send in, it is absolutely perfect! Years of excellent service and quality! I don’t want to go anywhere else! Thanks! Rated 5 out of 5 by Luis from Quality I purchased the magnets for my school. The magnets will be seen by the many people. They are awesome. They look great and the quality stands out immediately.